Following the placement of the structure that holds a dental implant in place, called an abutment, your gums are going to be a bit tender. It is an invasion for your mouth, and it is something that your mouth is going to have to adjust to. Thankfully, your gum tissue is relatively resilient when healthy. Getting a dental implant is going to help keep the jaw bone strong, which will help with the overall health of your gums. It is just going to take some time to heal before you get to see the full benefits. 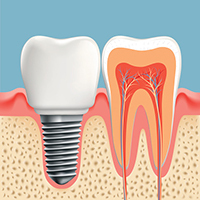 You will have a strict regimen to follow after getting dental implants. It will tell you what you can eat, and what you should avoid. This is meant to help you promote healing and help your body recover. You will be told how to keep your mouth clean, and how to rinse with salt water, including how often to do it. These things will all help your abutment heal securely into your jaw bone. Plus, they will also help your gum tissue stay healthy. If you follow this regimen carefully, your gums should heal up to being nearly painless in a few days, aside from putting direct pressure on the gums. The full recovery is 4-6 months, at which point, your gums should appear no different than they were before the procedure. If you want to know more about what to expect following the placement of new dental implants, ask your periodontist. They can walk you through the procedure, and what most patients experience in the aftermath. The procedure is far less painful to most people than what they expect going into it, and they often heal up just fine when they follow the regimen given to them after the procedure is complete. If you have any questions, or if you would like to learn more, please call us today at (480) 376-2848.